Discussion in 'LV Strip Hotels' started by jtdestef, Mar 24, 2016. I booked 3 nights a while back at the Mirage for a Wednesday-Saturday trip in May. I decided recently to add a night onto the end of my trip and stay until Sunday. By the time I went to book, the Mirage was more expensive than I was willing to pay, so I started looking elsewhere. I went ahead and booked a room at Harrah's for a little less than $100 for the night. I want to stay in that general price range, but I've read some bad reviews on places like Harrah's, Excalibur and Luxor (those seem to be the ones in this price range). I'm still in my 20's, so I'm not picky and really just looking for a place to crash for the night. Are the rooms in these "lower end" properties really that bad or is it just in comparison to the 5 star resorts they sit next to? Second question... If you had to choose between the lower end properties, which one would you choose? Bally's looks like it's sold out that night and some of the other places I've thought about (Monte Carlo, NYNY, Planet Hollywood) are $50-$80 more expensive for the night, which don't seem worth it since I don't spend much time in the room. So right now my choices are Harrah's (already booked), Luxor (would have to cab there), Excalibur (cab), and a couple of slightly more expensive options Flamingo and the Linq. I know everyone's preferences are different and I may or may not change, but I'm curious to see what other people would do. Did you try the Carnival Room South? Those are nice rooms. Personally, I'm not keen on Harrahs because their casino feels grimy but the hotel is plenty fine to stay / sleep in. If you look at the Trip Advisor boards, generally most on-strip properties have a 4-star rating. They aren't bad, you occasionally just have people with bad experiences. Nowhere is perfect 100% of the time. Harrah's is a very nice mid-level property. I have stayed there many times. I have also stayed at almost every other property on the Strip. Harrah's is nicer than Excalibur or Luxor and equivalent to the Flamingo. Have no worries about keeping your reservation. The crowd there is a 40-50 yo crowd but if you exit by the Carnival Court (good bands on Sat night!) you're only steps away from the Linq and Cromwell which have a younger hipper crowd. You should find the stay just perfect. Being in your 20's you might not much care for Ballys. It always feels like an older crowd to me there and kind of quiet and boring. I think you might enjoy the Flamino or Linq if you aren't super picky about the room. They aren't terrible, most are clean and comfortable. Just not as fancy as some of the higher end properties. I concur. Old people like me stay at Bally's and I'm among the younger ones there. Bally's is great but the 20 year olds don't stay there. Of course, when you generalize, people will come along and say you're wrong but Flamingo has plenty of 20 year olds. Excalibur is full of some 20 year olds and a lot of families trying to save a buck. Luxor creeps me out. Just don't like that place. Stay at Harrah's or Flamingo or Linq. I just got back from a 1 night stay at Harrah's last night. I was in the same boat as you where it was the cheapest at $100. 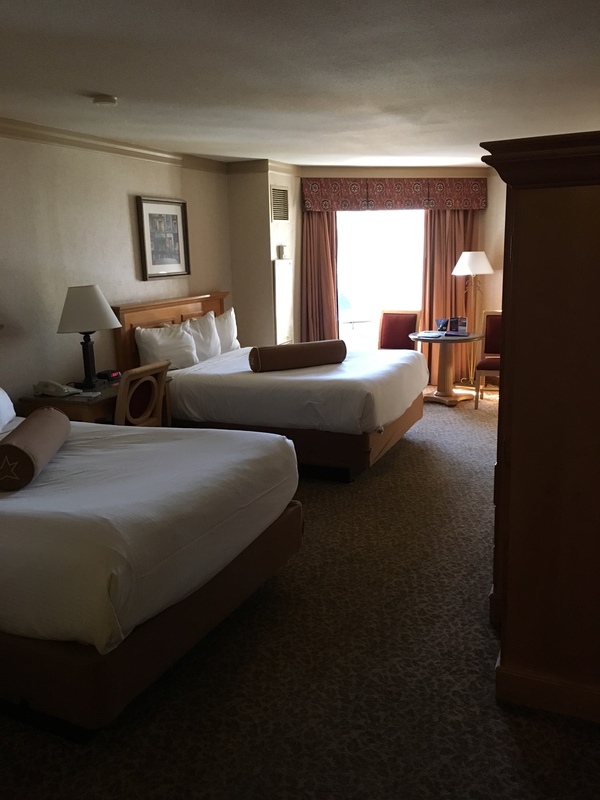 I sprang for a Strip View upgrade on the cheapest room and was pleasantly surprised. It had a great shower, comfy beds, clean everything, quiet, and all the things you need for a crash pad. I do agree, as a 22 year old, that it's not the greatest vibe in the casino, but as far as a room goes it's a great deal; great location and very close to better scenes. Harrahs is like a nice holiday inn express in another city. The rep it gets here is mostly just due to the quality relative to other strip properties which puts it towards the bottom. I'd stick with harrahs as its a decewnt room and thou can easily walk across the street to check in. Harrahs is just fine. They stay busy and do just fine. And, since you are at Mirage, you can easily just walk across the street with your bags. Easy stuff. Easy decision in my mind. We have stayed at both and many other places on the strip - actually most. Never stayed at Harrah's, but for being one of the lowest priced CET properties, it doesn't look that bad. I agree with the Harrahs choice. I have stayed there multiple times and it is just fine. Since you are at Mirage it's an easy walk across the street. Then again....since you just stayed at the Mirage....you may want a night at the other end of the strip just for a change. Stayed at Harrah's for one night, similar to your case. It was perfect as a crash pad and a very economical, yet clean one too. Definitely recommend it. Agree with the comments of the ages at Harrahs and Ballys. But if you're like me, and you appreciate a solid 7 hours of sleep, stick to those two places. PH has the best vibe of all the CET places I've been to, I just won't stay there cause I know someone will be banging on my door or blasting music at 4AM. Go for Harrahs! The problem is with the casino, not the hotel. The casino really doesn't have any problems - they have redone a lot of it over the last year in certain areas. Great new food court (might even want to walk over there from Mirage for food) with different options available. Carnaval Court is right outside the door. If you do want to sleep you may want to avoid a room facing that way. However, at your age you may want to be out in the middle of the action there! I find the Ballys comments amusing - I have been not as pleased with their casino in last couple years because the tables are filled with a lot younger (and louder) crowd than they used to be lol. If you're only staying one extra night, I would absolutely go with a hotel within walking distance. I really like MC, but why waste your last day wrestling with cabs? I have not stayed at Harrah's, but the pictures look like what someone else said, a decent hotel if it was outside Vegas, they just get knocked because there are so many 5 star hotels on the strip. As for an older crowd, that can be a plus...quieter. You have carnival court, Cromwell, etc. plenty close. FYI, charge everything to your room, and make SURE to always use your Mlife card while playing. Before you check out of Mirage, go to the Mlife desk and nicely ask if you've won any extra comps. A lot of time's they'll deduct some of your bill, up to even giving you back-end comped nights. (Don't count on room comps though, Mirage will require higher play to get that, but even if you have a meal or two comped, it's money in your pocket!) It took me a couple trips before I learned to do this, and now it's part of my standard operating procedure. Enjoy and have a blast! Thanks for all of the feedback! I was leaning toward staying at Harrah's anyway, but wanted to get some confirmation from people who have more Vegas experience than me. I'll keep checking to see if for some reason a nicer property drops in price, but I'll probably have my last night at Harrah's. Gotta remember, there's a lot of subjectivity on the VMB when it comes to property reviews. I know a guy who always stays at Excalibur - plays there and racks up the comps. Me, well, I'm pretty sure Excalibur would have to pay me to stay there. That being said, if it's just one night, and all you need is working plumbing, clean sheets and a door that locks...you could do a lot worse than Harrah's. And if, as you say, you don't spend a lot of time in the room; any funds not allocated to housing can be diverted to the discretionary dining, alcohol or gaming budgets.